After Douglas Fairbanks’s worldwide success with The Mark of Zorro and The Three Musketeers, no expense was spared for his next swashbuckler, 1922’s Robin Hood. The film is a spectacular saga of medieval chivalry, a lavish production on an epic scale, but is all about lords, ladies, and kings, with strangely little Robin Hood in it. It’s a weird boys’-club of a movie that’s mostly about the manly bromance between Fairbanks’s Earl of Hungtingdon and King Richard the Lion-Hearted, played with wearying brio by beefy Wallace Beery. Huntingdon is the knightliest knight when it comes to trouncing the others at tournament, but he’s strangely leery of the ladies, and when Richard tells him to take his prize from Lady Marian, he says (I am not making this up), “Exempt me, Sire. I am afeared of women.” Spoiler: he gets over it, as least as regards Marian. There follows about an hour of royal intrigue involving King Richard, evil Prince John, and Huntingdon, as the king leaves England to lead an army to the crusades. There’s a fair amount of regrettable nonsense about militant Christianity marching off “with high purpose” to wrest the Holy Land from the infidels. However, once Richard leaves Prince John to rule as regent until he returns, John immediately becomes an oppressive tyrant who turns England into Mordor. Peasants are robbed of all they possess, women are abused, and capering torturers burn and lacerate for John’s dour amusement. The movie’s more than half over before Huntingdon returns to England to set things aright by donning Robin Hood’s cap and tights. As a knight Huntingdon was stolid and earnest, but as Robin he’s suddenly as merry and active as Zorro and d’Artagnan. Fairbanks leaping like an acrobat was a revelation in The Mark of Zorro, but in Sherwood Forest a hundred Merrie Men imitating him and bounding about like springs is ludicrous. 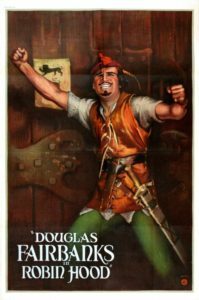 In fact, I find Robin Hood the least effective of all the Fairbanks swashbucklers because it’s so overblown in every way. All the sets are colossal, every tableau is teeming with extras, the language is highfalutin and purple, and everybody over-reacts to everything. Every actor overplays his role (except Sam De Grasse as Prince John, whose relative restraint actually makes him seem more sinister). Except for Little John—played by the talentless Alan Hale, who will assume the role twice more over the next thirty years—the familiar Merrie Men barely make an appearance, and none of the famous tales are even referenced, so it barely resonates as a Robin Hood movie. And gah, the hairstyles are terrible. The film was a big hit in its day, but I just I don’t find that it holds up particularly well 95 years later. I can’t recommend it.